Sheriff releases sketch of Summerville attempted kidnapping suspect | Crime Stoppers of the Lowcountry: 554-1111 | 1-888-CRIME-SC | Anonymous tips earn cash rewards with Crime Stoppers of the Lowcountry. SUMMMERVILLE, SC (WCSC) - The Dorchester County Sheriff’s Office has released a sketch of the suspect wanted for an attempted kidnapping of a Summerville teen. The reported kidnapping attempt happened early July 10 on Rosario Drive, in the Plum Creek subdivision. The victim, a Summerville teen, says she was walking and talking on the phone around 1 a.m. when low-rider pickup stopped next to her. The victim said a man got out, rushed up and grabbed her. The teen was able to fight the suspect off, but said she took an elbow in the face during the scuffle. The victim then ran home. 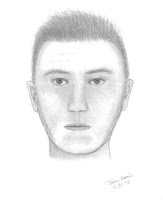 The attacker was described a white man approximately six feet tall with short dark hair and possibly in his 30s. The teen says he was driving a small, older model, dark pickup truck that appeared to be a low rider. The case is still under investigation by The Dorchester County Sheriff's Office Criminal Investigations Division. If you have any information on the crime, call investigators at 843-832-0318.